4. One of our lamps got missed out. 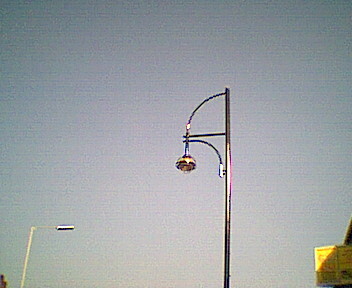 Most of the completed new lamps had been painted black  while leaving a stripe of unpainted dark grey undercoat for the gold trim  by mid-April. 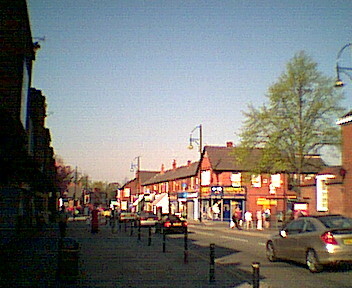 But this one at the mini-park at the junction of Compstall Road with Sandy Lane was overlooked for no apparent reason. It remained obstinately completely dark grey until May 21st. 4a. They got to it at long last. 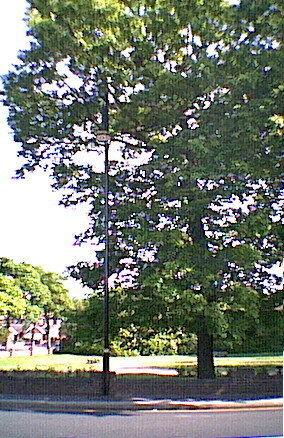 The thinking is that this lamp became invisible among the oak tree's full set of leaves. Finally, someone remembered it and sent the painters out, and they probably turned a lot of leaves black as well as the lamp, which underlines the perils of procrastination. 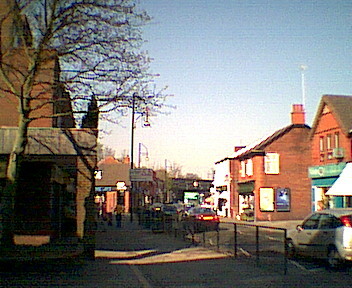 According to a witness, the job involved hacking a lot of the tree off and leaving the bits lying all over the pavement. 5a. Left : This is what the top of a standard new lamp looks like. The lamp is painted black and the sun is glinting from it. 5b. Right : This is the fancy top of one of the twin lamps at the eastern end of the new lamp zone with the sun shining on it. The cowboys may be planning something similar for the western end of the new lamp zone but that's a long way from being finished off. 5c. Here is a comparison of the plain and fancy types of lamp top. 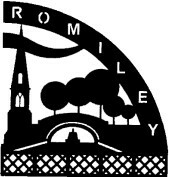 The device on the fancy ones has ROMILEY in an arc around a cut-out image showing St. Chad's and the canal bridge, along with some pom-pom trees. Also, there is a girder structure at the bottom of the design, which is intended to represent the railway bridge (see pix 19, 27, 37 for the railway bridge in real life). 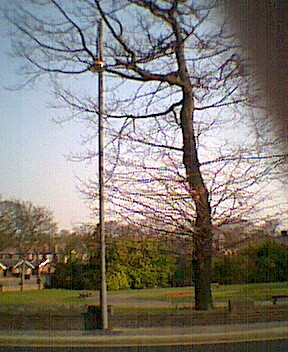 Note : Marple also has the new lamp posts, but there are no fancy tops at the western end of their new lamp zone. In the foreground is a black-painted new lamp with an unpainted area of dark grey undercoat ready for painting when the Trivial Democrat council decides that it can afford a tin of gold paint. 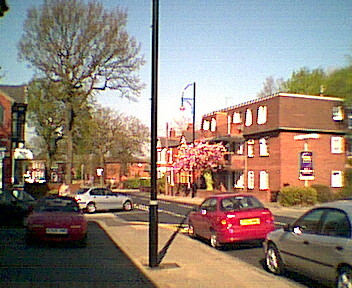 The new lamp shown in the first picture of the sequence appears again in front of the old people's flats on the right side of the road. 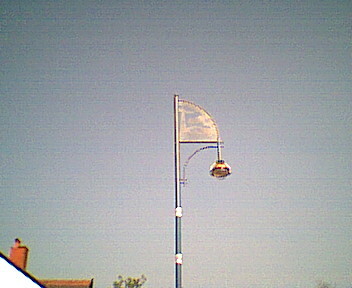 The old lamp shown in picture 1 had been removed when this picture was taken. Two shots of the main drag fairly early on in the morning, hence the well-developed shadows.